Can’t make it to Los Angeles? Don’t miss this opportunity to have the best seat in the house! 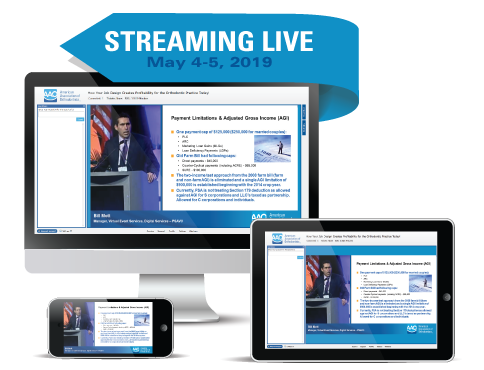 Welcome to our livestream event broadcasting from the Doctors Scientific Program at AAO 2019 on Saturday, May 4 and Sunday, May 5. This event will feature trending topics from a variety of well-known speakers about Sleep Apnea, Pre-adolescent Treatment and Evidence/Advances as well as the inaugural William R. Proffit Memorial Lecture presented by Dr. Kevin O’Brien, Professor of Orthodontics at the University of Manchester, United Kingdom. Too busy to commit to both days? Choose a one-day package instead! View the schedule of sessions by clicking HERE or the Live Sessions tab to the left. Confirmed registrants will connect virtually and have an opportunity to submit questions during each lecture (live Q&A as time allows). Each session will provide .5 to 1.0 hours of live CE and will be earned per session. And… don’t forget about Conference Archives! This livestream event will not be recorded; however, you can purchase the AAO 2019 conference archives content HERE. These synchronized audio and/or presentation slide recordings will include 92% of the sessions presented in Los Angeles! Each participant can earn up to 12.0 CE credit. American Association of Orthodontists is an ADA CERP Recognized Provider. ADA CERP is a service of the American Dental Association to assist dental professionals in identifying quality providers of continuing dental education. ADA CERP does not approve or endorse individual lectures or instructors, nor does it imply acceptance of credit hours by boards of dentistry. Concerns or complaints about a CE provider may be directed to the provider or to the Commission for Continuing Education Provider Recognition at ADA.org/CERP. This Continuing Education Program provides attendees with a relevant and rewarding continuing education experience. However, neither the content of a course nor the use of specific products in any program should be construed as indicating endorsement or approval of the views presented or the products used by the AAO or by any of the respective subsidiaries. Speakers are required to disclose to participants any financial, commercial or promotional interest in a product or company that may influence their presentations; however, the AAO shall not be liable for a speaker’s failure to disclose such interest. Please be advised that courses, speakers or scheduling may change without notice. Registration Refund Policy: Registration must be received within 72 business hours after the live event in order to receive a refund. Submit your request in writing to the AAO Education Department via email to education@aaortho.org. Telephone cancellations will not be accepted. Your refund request should include the name of the person the registration is under, name and date of the event, and the reason for the refund. All refund requests are subject to approval by the AAO. All approved refunds will be processed within 30 business days after the approval.